Spring treasure 8: What’s soft, furry and nearly as sweet as ducklings? 14/5/2018 You would probably never guess that I wasn’t referring to an animal if I asked you this question. You might also legitimately reply, ‘nothing is nearly as sweet as ducklings’. You’d be nearly right. But not quite. I’m referring to the best of all new spring leaves: beech leaves. 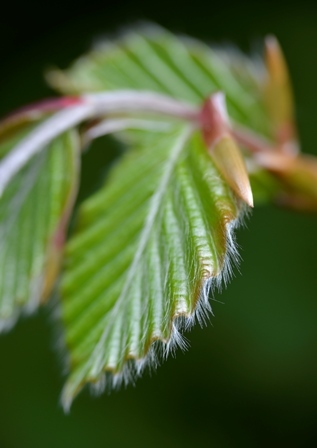 If horse chestnut leaves are difficult to resist touching, these are impossible. I’m afraid that I might be diagnosed as insane if anyone caught me unawares in their presence; but as long as I was left to enjoy my insanity in peace, I wouldn’t mind too much. I treat them pretty much the same way I treat my animals. As you may have deduced by now, they have a similar effect on me as ducklings. 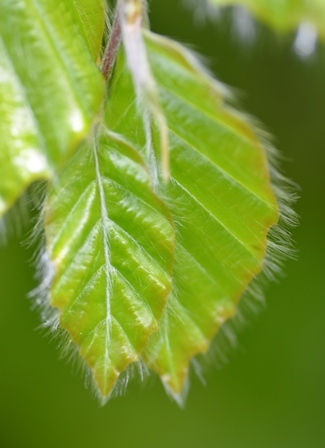 I can understand the evolutionary advantage in baby animals being sweet – assuming humans aren’t the only species capable of recognising this quality – but what possible advantage can there be for a tree to have adorable baby leaves? Surely they’d just get eaten more often. I did, in fact, try eating them once, having read in Richard Mabey’s Food for Free that they were good in a sandwich. They were tender, but simply tasted of chlorophyll. I decided that they were far better appreciated on the tree, especially as I’d felt almost criminal for having picked them. I can’t think of a legitimate reason for them to be so appealing. So instead I’m just going to enjoy them as one of life’s gifts. 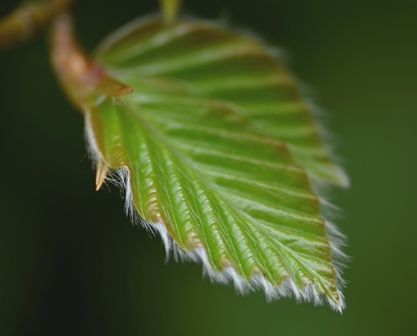 They always make me think of a friend of mine’s blind friend, Claire, who loved to touch newly-emerged beech leaves. I love their colour too, and seeing their furry edges, but If I had to choose one feature of spring that I’d be happy to experience solely by sense of touch, this would be the one.